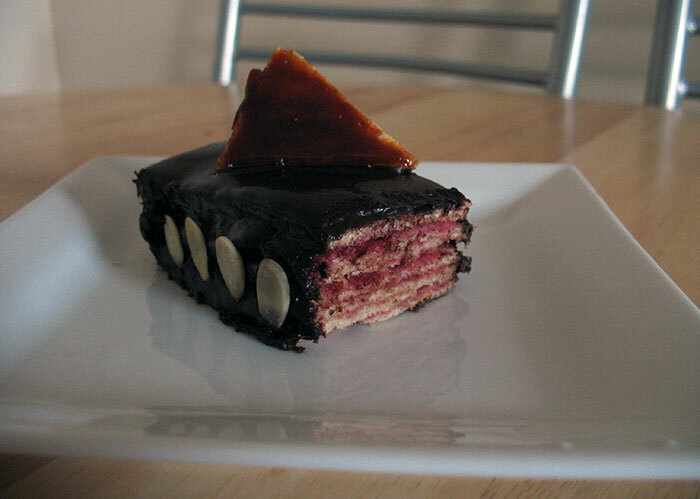 The basic idea of a dobos torte is to layer thin layers of sponge with chocolate buttercream and top with caramel coated sponge. Most of the ones I have seen are circular and have between 6 and 8 layers of sponge. So to be different (but not all that different in the end) I made a rectangular one of around 2″ by 6″, which made enough for about 4 people. I may have mentioned previously that I don’t really like buttercream. So the idea of a cake that is thin layers of sponge stuck together and then entirely coated with buttercream is not my idea of heaven. I am still not sure what it is about buttercream that I don’t like, so I tried two different ways of producing a Dobos to my liking. Firstly what do you call a buttercream where you don’t add the butter? Missing out this stage seemed to have some added benefits, I felt less guilty about just how bad the torte was for me, but more importantly while some were tweeting that their buttercream wouldn’t set mine was almost solid, like Nutella, maybe somewhere in the middle would be best for next time! Secondly, remember last Daring Bakers I mentioned they should be more seasonal? To try and put a more summery slant on my torte and more importantly to make it less buttercreamy – I used Cherry Jam to stick my layers together. Then the (butter)cream to coat the outside of the torte. See the pretty pink filling between the thin sponge layers! I think this worked out for the best for me. 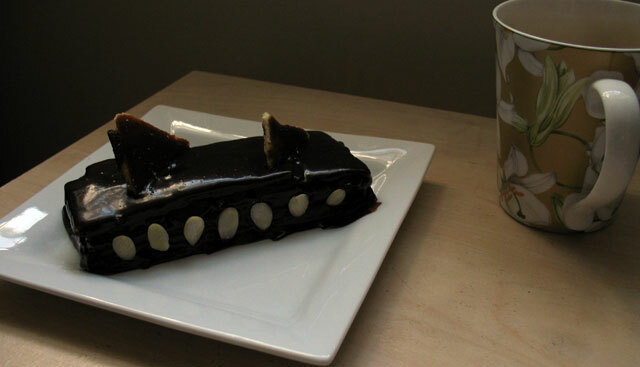 Dark Chocolate and Cherries go wonderfully well together, and neither the jam or the chocolate was too overpowering. Admittedly I feel a little ashamed about buying the jam from Tesco. The original plan for this months Daring Bakers is that I would need several attempts, so I could use the store-bought jam the first time when it didn’t matter. However my first attempt wasn’t a disaster, and in the end I ran out of time, I also had plans for a raspberry and white chocolate torte – which I think would have been out of this world. All directions and measurements come from Not Quite Nigella‘s challenge post, with only small changes from me. Cut parchment paper to fit the baking sheets. Draw out the shape you want to make your torte (adding some extra space in case the edges become crispy). I made mine large rectangles, so I could cut them into smaller strips, so I didn’t need to use one baking sheet per layer. Turn them over (the shape should be visible from the other side, so that the graphite or ink doesn’t touch the cake batter. Line one of the baking sheets with a shape-marked paper. Using a small offset spatula, spread a really thin layer of sponge onto the parchment tracing the shape you marked out on the paper. The thiner you make this the better your torte will appear and the easier it will be to assemble. Bake on the top rack for 5 minutes, until the cake springs back when pressed gently in the centre and the edges are lightly browned. Keep an eye on it (if you get yours very thin it could take less than 5 minutes). While this cake bakes, repeat the process on the other baking sheet, placing it on the centre rack. When the first cake is done, move the second cake to the top rack. 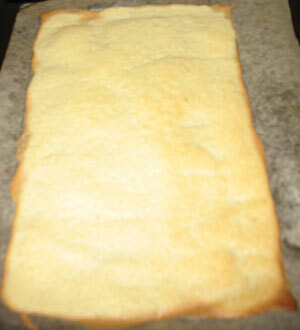 Invert the first cake onto a flat surface and carefully peel off the paper. I had troubles with getting the layers off the parchment, this could be because my parchment is really cheap quality, or because my layers were so thin they tear easily. Slide the cake layer back onto the paper and let stand until cool. Rinse the baking sheet under cold running water to cool, and dry it before lining with another parchment. Continue with the remaining papers and batter. Completely cool the layers. Trim each of the layers into an identical shape (I got 3 layers from my 1/3 of recipe, which I then cut to make 8 layers). 2 sticks plus 2 tablespoons (250g) unsalted butter, at room temperature. (I missed out the butter and I think it tasted just fine). I quartered this recipe (as I was only making enough for the outside of my much smaller torte). Optionally, When cool, beat in the soft butter, a small piece (about 2 tablespoons/30g) at a time. An electric hand mixer is great here, but it is possible to beat the butter in with a spatula if it is soft enough. You should end up with a thick, velvety chocolate buttercream. Chill while you make the caramel topping. Choose the best-looking cake layer for the caramel top or if simply adding small triangular chunks of caramel topping to your cake then find decent cut-offs to use. 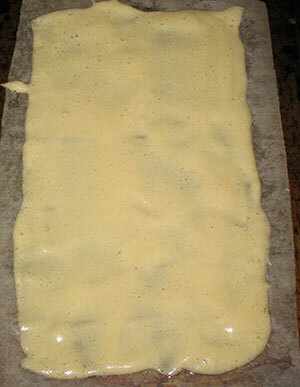 Line a jellyroll pan with parchment paper and butter the paper. Place the sponge on the paper. Cut the sponge into shape. Stir the sugar, water and lemon juice in a small saucepan. Bring to a boil over a medium heat, stirring often to dissolve the sugar. Once dissolved into a smooth syrup, turn the heat up to high and boil without stirring, swirling the pan by the handle occasionally and washing down any sugar crystals on the sides of the pan with a wet brush until the syrup has turned into an amber-coloured caramel. (Watch this because mine was looking perfect one second and when I turned back it had burned. Spread the caramel over the sections of sponge, I poured mine over – but this turned out to be a mistake, as then it was really difficult to get the sponge back off the paper once the caramel had set. Let cool until beginning to set, about 30 seconds. Using the tip of the hot oiled knife (keep re-oiling this with a pastry brush between cutting), cut through the scored marks to divide the caramel layer into 12 equal wedges. Cool another minute or so, then use the edge of the knife to free the the wedges using one firm slice movement (rather than rocking back and forth which may produce toffee strands). Cool completely. Now that you have all the parts of your dobos you need to put it together! Place the first layer of sponge on a piece of baking parchment, then cover the sponge layer in a thin smear of your cherry jam, so that it is entirely covered. Repeat with the remaining layers, although don’t put jam on the top layer. Spread the (butter)cream on the sides and top of your dobos, making sure it is entirely covered. Optional: press flaked almonds onto the sides of the cake. Top with the triangles of caramel sponge. Refrigerate the cake until the icing is set, about 2 hours. Let slices come to room temperature for the best possible flavour. This Torte tasted amazing, and really made competing in the Daring Bakers worth while. It was difficult without being too time-consuming. There were lots of different stages, but they didn’t need to all be done in one day. All in all I would say this challenge was a success, and I am definitely in with the Daring Bakers for a while longer. In fact I even signed up for Daring Cooks… so watch this space!